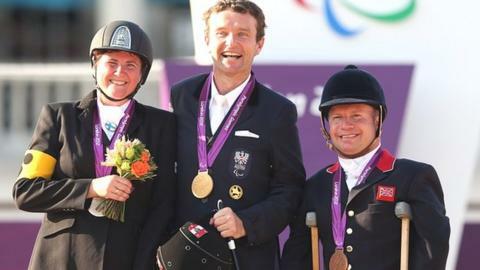 Britain's Lee Pearson failed in his bid to win a record-equalling 11th Paralympic title, finishing third in the Grade Ib freestyle dressage. Pearson, 38, scored 74.2% on his horse, Gentleman, but was relegated to second by Austrian Pepo Puch, who scored a massive 79.15%. Finland's Katja Karjalainen, the last competitor to go, also overtook Pearson with a score of 74.25%. GB's Natasha Baker won a second gold with victory in the Grade II freestyle. Pearson had missed out on beating the 11-gold mark of Baroness Tanni Grey-Thompson and swimmer Dave Roberts when he was beaten into second by Australian Joann Formosa in the individual test on Saturday. He put in an impressive display on Monday with his James Bond-inspired routine, but Puch, who had won bronze behind Pearson in the individual test, snatched gold. Pearson, who has now won gold, silver and bronze in London, criticised some of the judging after appearing to be marked incredibly harshly by British judge Sarah Rodger. She awarded him only 65.250%, compared to Argentine Lilian Iannone, who gave Pearson 78.250%. The marks of all five judges are averaged out to give the final score. "I don't know what the politically correct answer would be other than to say it has happened before with that judge and it will probably happen again," Pearson said. "She obviously saw something the others didn't." He added that he would attempt to add to his medal haul at the 2016 Games in Rio de Janeiro. "I am pleased with the medals I have got," he said. "Rio, here I come, but with a different horse." Baker, 22, set a personal best and a Paralympic record for her class with a mark of 82.8% on board Cabral, beating Germany's Britta Napel by more than 5%. "It's fantastic," she said. "I'm so proud of JP [the nickname for the horse]. My expectations of him were great and he has exceeded them." Baker contacted transverse myelitis, an inflammation of the spine which affects the nerve endings, when she was 14 months old but has ridden horses on the family farm since she was a child. She was inspired to compete after watching the 2000 Games on television and won double gold at last year's European Championships. "Ttwo Paralympic records and two gold medals in my first Games in London. Wow!" she said. "It has been an amazing experience to be here and Rio won't be the same without this crowd."